How quickly can I make these!?! Hard Boil the eggs: Place eggs in a single layer in a saucepan and cover with enough water that there's about 1" of water above the eggs. Heat on high until water begins to boil for 1 minute, then cover. Remove from heat and leave covered for 15 minutes, then rinse under cold water. Crack egg shells and carefully peel under cool running water. Dry with paper towels. 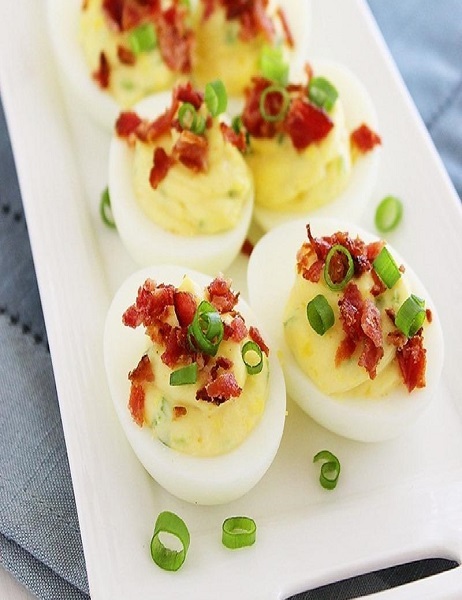 Slice the eggs in half lengthwise, removing yolks to a medium bowl, and placing the whites on a serving platter. Mash the yolks into a fine crumble using a fork. Add mayonnaise, mustard, FIREWALKER Hot Sauce, spices and herbs and mix well (work the wet ingredients one by one and adjust accordingly to ensure the mixture doesn't get too runny, egg yolk size will vary).